What can we know of what's most profound? In these brief and lyrical fictions, Rob Davidson offers us glimpses of what remains out of reach. He writes, "There is inside of us dark music, the melody of expectation." Brilliant, his dark music--whether his words fulfill or expand or thwart our desires. His wise language assures us: "Disappointment has its benefits, nudging us toward joy." Tiny marvels, these flashes. Beautiful mystery, this book. Sometimes you command more attention by lowering your voice. Sometimes you say more by choosing to say less. Sometimes the essence of a situation, a character, even of an entire life presents itself, suspended like a specimen, in a single gesture, a spoken phrase, an image, a glance. 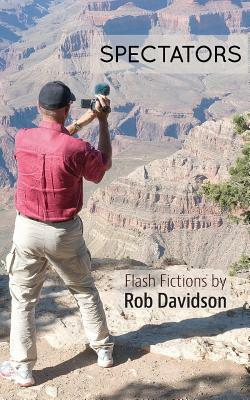 Rob Davidson's stories in Spectators go straight for the metaphysical jugular, offering vividly sketched characters in whom you will surely recognize yourself, creating stealthily constructed miniature worlds in which you will surely recognize the big old world you and I walk through on a daily basis, dumbfounded and amazed and taking in the sights. As the beautifully crafted stories of Spectators build, become brief steps and steles in a longer journey, the voices and visions, the flashes and glimpses lead us to new thresholds: that region of memory and desire, story and imagination, where we "eternally arrive." Even in all its brevity, fragmentation, and rendering of globalization's affects, Spectators is a big, bold, expansive, and heartfelt work that shines with Rob Davidson's masterly writing.